Did you know that, at just 22%, women account for a significantly smaller share of the oil and gas workforce than in almost any other sector? Or that only 7% of board members and 1% of CEOs are female? This video, produced by The Oil & Gas Technology Centre in association with POWERful Women, presents some eye-opening statistics on the current state of play, what women believe are the hurdles to advancing their careers and why now is the time to act. The video was first shown at the OGTC’s inaugural “Evening with Eight Fabulous Female Industry Leaders” in September last year. A range of speakers across oil and gas and other private and public sectors spoke about their career highlights and challenges, providing the audience with inspiring insights to aid others in their career journey. A message to the nuclear industry on gender diversity from Gwen Parry-Jones, POWERful Women Board Member and Executive Director of Operations at Horizon Nuclear Power. Check out this video of Gwen at the International Atomic Energy Authority’s conference in Vienna to hear her talk about the value of diversity, and how to get the best people by thinking about what women need. ‘How the UK’s gender pay gap legislation has given companies in the energy sector a fresh impetus for change.’ Watch the video here. 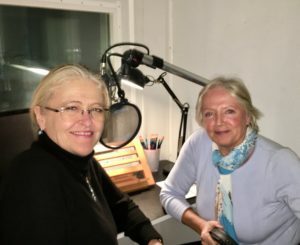 Our POWERfulWomen podcast series features leading inspirational women in the energy sector and in this edition our Board Member, Laura Sandys, talks to founder of Belize Natural Energy, Susan Morrice. Laura has had an illustrious career in business and politics. She was Conservative MP for South Thanet from 2010 to 2015, which is when she co-founded POWERful Women, and Laura now runs her own policy consultancy, Challenging Ideas. Susan is an entrepreneur and the founder and chairperson of oil exploration company Belize Natural Energy. An experienced geologist, she grew the business to become the number one revenue generator in Belize for the past decade. To listen to the podcast in a new window. 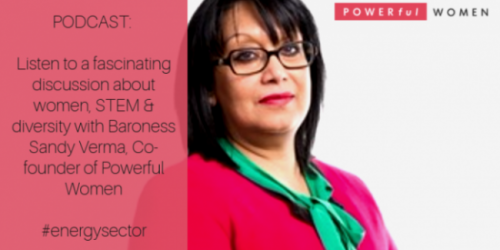 In this episode Sandy Verma discuses founding Powerful Women to address the under representation of women in the energy sector, supporting middle management and encouraging progression to executive and board roles. We are all ambassadors and all have a responsibility to be disruptive in promoting the sector and attracting women into energy. To listen to the podcast in a new window. In this episode Sandy Verma discusses the experience that people from different backgrounds can bring and how companies with diverse boards do better. We need to be more creative in how we can achieve this and have the confidence to take risks. This will encourage work life and social norms to change – to acknowledge that men and women are shareholders in both careers and at home. To listen to the podcast in a new window.